Elizabeth Strout’s previous best selling book, Olive Kitteridge, was truly an enjoyable & memorable read for me a couple of years ago. I anxiously anticipated the arrival of her newest book, The Burgess Boys, & was deeply moved as well by this story too. The Burgess Boys is my book club’s August selection and I’ve discovered at BookMovement many other clubs are choosing it as well, due to the diverse story lines which lend itself to many levels of discussion — a winner for book clubs! There were several layers to The Burgess Boys, but first and foremost, its about family and how family dynamics can shape a person’s life. When young Zachary (son of Susan Burgess) is accused of committing a horrendous crime, Jim & Bob, both successful lawyers in New York, come back to their small hometown in Maine to lend their assistance. As I delved further into the book several underlying issues and deep past hidden secrets gradually came to light, specifically a tragedy all three shared as young children. Each well developed storyline in The Burgess Boys slowly evolved drawing me further and further into the lives of siblings, Susan, Jim, & Bob Burgess. Throughout the novel I saw each sibling struggling with personal issues which they tried to break free of and change. As a reader, I found myself caring and hoping Susan, Bob, & Jim would find the strength to move forward and conquer what was weighing each of them down. 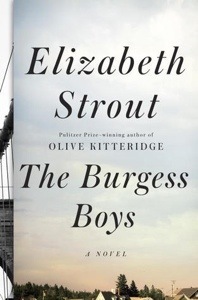 Strout once again has written a endearing, well written, & remarkable story! Jo Nesbo has once again written an engaging murderous tapestry of a book with Nemesis, Book 4 in the Harry Hole series! It was like being on a roller coaster ride with the many twists, turns, & surprising events that took place throughout the story. Each event was woven together with such artistry. So many murders, so many suspects but where will it all end?! Wondering if someone is out to get Harry & sabotage his job? For sure! Nemesis is a complex well crafted thriller! Now onto The Devil’s Star, Book 5 in the Harry Hole series!